Leonardo da Vinci (1452 – 1519) was one of the great men of the Renaissance. Born in 15thcentury Florence, as well as painting the Mona Lisa, he invented, or designed, a great many visionary machines that did not become commonplace until the 20thcentury. Here, Jamil Bakhtawar tells us da Vinci’s 9 greatest inventions. Leonardo da Vinci. 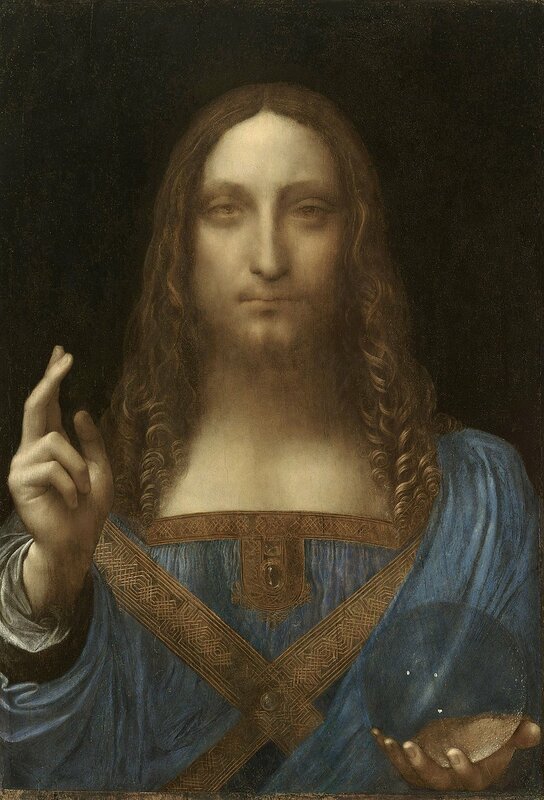 Painting by Salvator Mundi, c. 150..
Leonardo da Vinci captured the scientific foundations of Renaissance art — perspective, light, proportions, and anatomy — and extended them into every aspect of the investigation of nature. He regarded art as the ultimate form of visual knowledge, founded on an understanding of how nature works. In all his activities, he sought a core of mathematical rules that governed the operation of all things in nature. The rules dictated how humans should explore nature in art, science, and technology. Every machine can be regarded as a new kind of 'body', taking its cue from nature but not directly imitating it. All of his inventions were based on an understanding of the science of nature. In terms of technology, da Vinci's vision embraced the potential of civil and military engineering on colossal scales and involved complex levels of automation. The designs for the grandest machines were consciously visionary and lived on paper as a form of 'visual boasting' directed at patrons rather than aspiring to be actual constructions. The inventions that Leonardo da Vinci put into practice were his expensive and massive mechanisms for the theatre, which involved such things as mountains that opened up. His most important intellectual contribution to engineering was that he was the first to insist that mechanical devices should be designed in keeping with the mathematical laws of nature. He was also the first to invent separate components or 'elements of machines', which could be deployed in various devices. Here are nine of da Vinci’s greatest inventions. Leonardo was heavily preoccupied by the inadequacies of contemporary warfare, frustrated particularly by the time-lag between rounds of cannon fire, caused by the necessity to reload. Leonardo devised a multi-barreled cannon that could be rotated to fire a line of cannons whilst another was being reloaded: a primitive ancestor of the modern day machine gun. Cannons from a late 15th century/early 16th century drawing as shown in The Life and Times of Leonardo, Paul Hamlyn. The 'helical aerial screw', conceived by Leonardo in 1493, consisted of a spinning linen screw designed to compress air to induce flight: a mechanism similar to that employed in contemporary helicopters. Leonardo’s design is widely credited as the vertical flight machine. In conjunction with his studies of flight, Leonardo conceived a modern design for an 'anemometer', a device that measures the speed of wind. Adapted from an original design by Leon Batista, Leonardo’s additions made the device considerably more accurate. Habitually doing things with style, Leonardo’s anemometer is also a beautiful thing to look at. Leonardo’s revolving bridge was not just an engineering marvel and an innovation in warfare, but also a rare early example of flat-pack design. Designed in the 1480s for Duke Sforza, the bridge allowed troops to cross rivers quickly, and could easily be packed up and transported for reuse elsewhere. In technical terms, the bridge was envisioned to a have a counterweight tank that would make the structure balanced on both sides. As for its ease of transportation, the design was contrived to have wheels and a rope-and-pulley system for effective deployment in a brief span of time. Leonardo is widely considered the first engineer to be credited with designs for man-powered flight. The discoveries made during countless dissections of bird and bat wings are evident in the designs for the Ornithopter, a device that flies by flapping winged appendages. The influence of his drawings can clearly be seen throughout flight designs for the next 400 years. Arguably the most famous of da Vinci ‘hacks’, the flying machine (or the ‘ornithopter‘) was basically envisioned as a wooden frame with two extending wings that amounted to a wingspan of more than 33 feet (about 10 meters). This core frame was to be built from lightweight yet sturdy pinewood while being draped in raw silk to add to the ‘feathery’ equation. As for the powering mechanism, the conceptual design boasted a rod-and-pulley system that would have controlled the wings while the pilot placed his effort into the pedals (bolstered by a hand crank that could increase the energy output). The pilot could also steer the contraption via a headpiece – an unenviable task as demonstrated by one of the levels in the video game Assassins Creed: Brotherhood. In any case, what separated the flying machine from modern aircraft is its lack of an engine mechanism. Therefore, while the ornithopter could have flown in mid-air, it would have been challenging to get the machine off the ground. Neither sky nor sea knew any bounds for Leonardo. Conceived in Venice as a sleuth weapon to strike invading ships, Leonardo’s 15th century design of a diving suit consisted of cane and leather tubes attached to a facemask and supported by steel rings to resist water pressure. The premise of the suit bares remarkable similarities to the systems that are still in use today. The diving gear was also envisaged as military equipment which could be used for marine-based surprise attacks on enemy vessels. Interestingly, the diving gear was imagined in such a manner that the mask would possess an additional inflatable balloon-like device that would aide the diver to submerge or come up above the water level. The self-propelled cart, allegedly designed for theatrical use, was designed to move without being pushed. Powered by coiled springs, it also featured braking and pre-programmable steering systems. Possibly a precursor to modern-day automobiles, the self-propelled cart is equally unique due to its ‘robotic’ credentials that pertained to pre-determined steering features. Once again, the self-propelled cart was re-imagined in contemporary times, by people at Italy’s Institute and Museum of the History of Science. The machine was created by basing its design on da Vinci’s initial sketches, and the outcome was remarkable. Researchers found that the furnished vehicle looked much like the Mars Rover, while its navigation system worked according to its conceptualized origins. Although the first parachute is frequently credited to Frenchman Sebastian Lenormand in 1783, evidence has been collected that shows Leonardo got there first. A sketch of his is accompanied by the annotation: 'If a man has a tent made of linen of which the apertures have all been stopped up, with twelve braccia across and twelve in depth, he will be able to throw himself down from any great height without suffering any injury'. It is unfathomable to believe something as 'modern' as a parachute could have been invented over 500 years ago. Leonardo’s parachute design consists of a sealed linen cloth held open by a pyramid of wooden poles — about 22 feet (or seven meters) long. The invention would allow any man to glide down from a tremendous height. Still, because his ideas were ahead of his time, the technology was unable to sustain his ideas, thus nobody invented a practical parachute until 1783. Like many of his monumental discoveries, Leonardo’s parachute was never tested. However, in the year 2000, daredevil Adrian Nichols actually built a parachute based on Leonardo’s designs. Despite considerable skepticism from many people, the parachute worked smoothly and Nichols even complimented its smooth ride. The robotic knight was an early example of automation which was operated via a series of pulleys and levers that mimicked Leonardo’s anatomical observations of the human muscular structure. Clad in heavy German-Italian medieval armor, the mechanical knight was conceived in 1495 and was ceremoniously displayed at the Court of Milan during a gala hosted by the city’s Duke Ludovico Sforza. Fueled by these internal mechanisms (distributed evenly across the torso and the body’s lower-part), the robotic ‘knight’ theoretically maintained the capacity to both sit down and stand up, whilst demonstrating its ability in lifting its visor and even moving its head. And quite intriguingly, the famed roboticist Mark Rosheim (known for his contributions to NASA and Lockheed Martin) successfully constructed a version of this humanoid automaton in 2002 by making use of da Vinci’s drawings. The result aptly demonstrated the effectiveness of the original design with the robot being able to fluidly move and wave. Leonardo da Vinci may well have been the greatest inventor during the Renaissance; however he had very little effect on the technology of his time. Da Vinci drew sketches and diagrams of his inventions, which he preserved in his notebooks, but he either neglected building them or was unable to convince his wealthy patrons to finance construction of the designs – although many of them could not have been built with the technology of the day. As a result, almost none of da Vinci's inventions were built during his lifetime; and because he never published his diagrams, little was known about them until his notebooks were discovered after his death. His inventions have continued to inspire engineers and scientists to this day. What do you think is da Vinci’s greatest invention? Let us know below.